The vibrating screen feeder is a kind of feeding equipment which is specially designed for the uniform, timing and continuous feeding of crushing equipment and screening equipment. It can also roughly screen the materials, which is also a special type of vibrating screen. The following is a brief introduction of the vibration screen feeder related to the situation. Both crusher and vibrating screen, the machine itself has the capacity of design, materials in unit time capacity is limited, if one-time charge too much, will reduce the efficiency of the crusher and vibrating screen, too much material may crush the screen, this needs in unit time on the fixed materials; However, if the discontinuous delivery of materials not only increases the operation, but also reduces the production efficiency, so a vibrating screen feeder is needed to provide continuous. The use design of vibrating screen feeder determines that the vibration feeder is a type of machine that is widely used. It is found in the crushing and screening combined equipment in many industries. Metallurgy, coal mine, mineral dressing, building materials, chemical industry and abrasive are mainly applied in the industry. 1. The vibrating screen feeder has a simple structure, mainly composed of a vibration motor and a silo, which is small in size and light in weight. 2. Easy to install and maintain the vibrating screen feeder. 3. 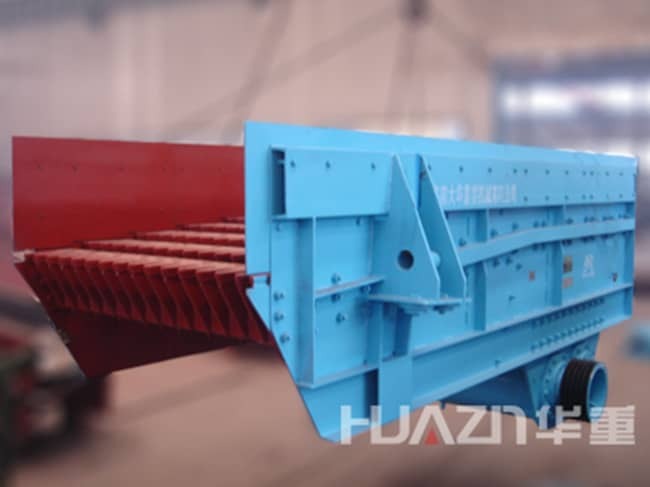 The front section of the vibrating screen feeder has a grid design, and the distance between them can be adjusted, which can effectively prevent material blockage and adapt to materials of different sizes. 4. Low energy consumption, low noise, energy saving and environmental protection. 6. The vibration force of the vibration motor can be adjusted according to different production requirements, and the flexibility is higher.